For the first time in its history, Amazon shares traded above $300 a piece this week. When Jeff Bezos took his company public in the spring of 1997, it was trading below $2 a share*. The online giant closed out Friday at a record $307 a share. 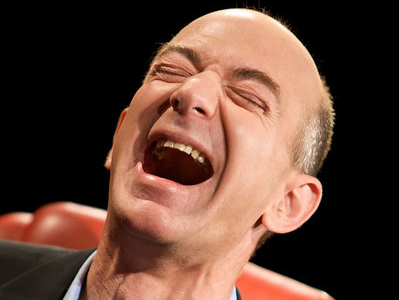 At its current stock price, Amazon’s market capitalization is $140 billion. For real. Still, that number is dwarfed by the market caps of two of the other three Internet Big Four: Google ($306 billion) and Apple ($400 billion), but more than double that of the newbie of the group, Facebook ($63 billion). Amazon reported net sales of $16.07 billion in the first quarter of this year, a 22 percent increase over the $13.18 billion it registered in the same period last year. Net income fell 37 percent, to $82 million. The company will report second-quarter earnings on July 25.